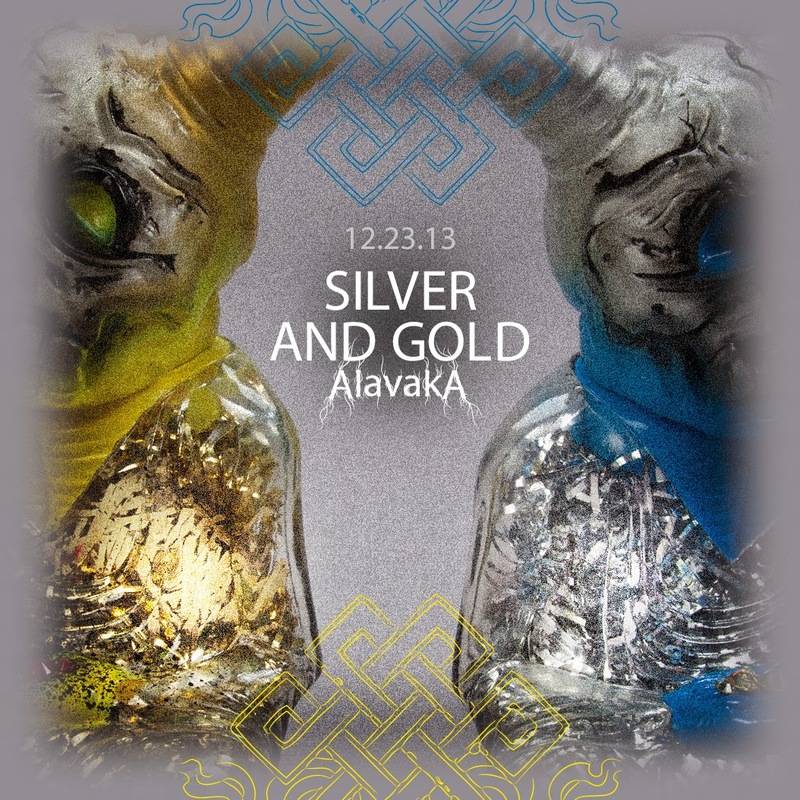 Devil's Head Productions has got one more trick up their sleeve this year in the form of this double holiday release. The Alavaka is available in clear vinyl with black, silver and blue paint or black, gold and yellow paint. Each one is holding a holiday offering of jewels! 5 pieces sold at random. Plaseebo is pleased to offer The FRANKENSTEIN MONSTER Bust / edition one. A new sculpt by Bob Conge measuring nine inches high, hand cast in solid resin and weighing over four pounds. Hand painted and signed in an edition of only three pieces. 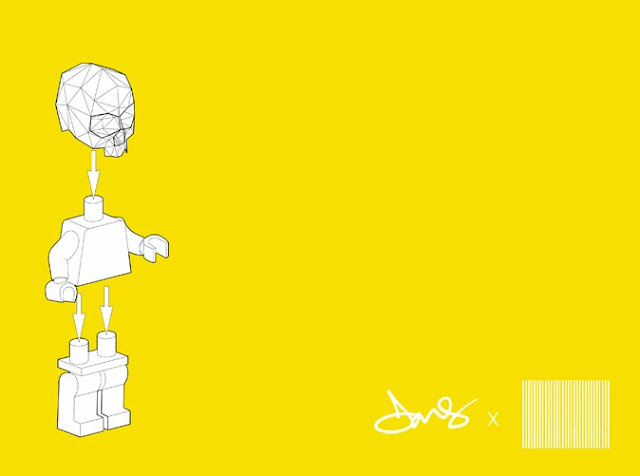 The edition will be available from the Plaseebo web shop on Christmas day for $550. 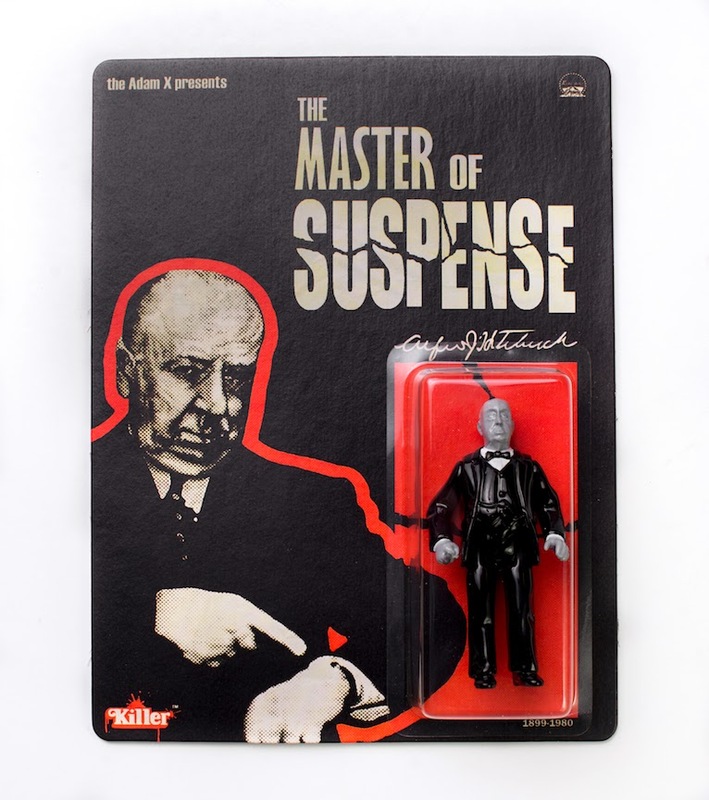 It's going to be a KILLER Friday with the release of the one and only 'Master of Suspense' Alfred Hitchcock bootleg action figure!!! 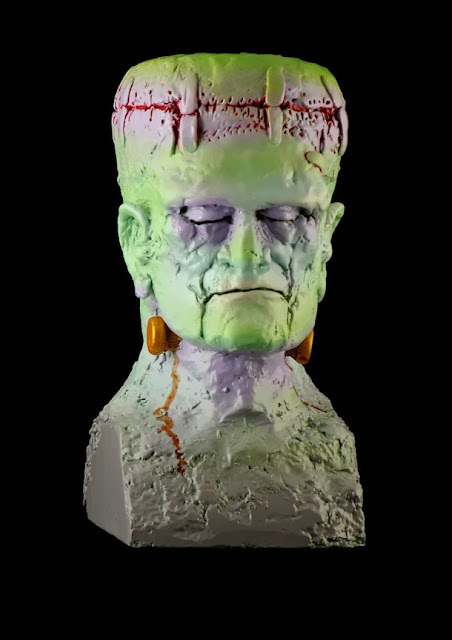 Killer Bootlegs and Hamfx have teamed up with The Adam X to put people in a FRENZY with this 3.75" resin collectable. Limited to an edition of 50 pieces backed by a vintage movie poster inspired card designed by Luke Yates and printed by Sidekick Media. Will these sell out??? Without a SHADOW OF A DOUBT! So don't be a PSYCHO and get one!!! 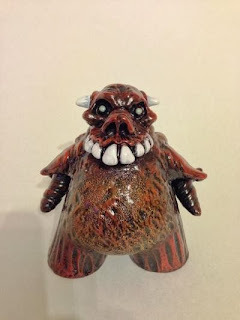 Bat-Nosed Basilhog still available at We Become Monsters - but only until Xmas Eve! We Become Monsters will be closing it's online doors temporarily after Xmas Eve, but before that happens, you've still got time to take your pic of some new goodies, and a few old favorites like the ones seen here! The Bat Nosed Basilhog, 'bat nosed' because these basilhogs echolocate nasally, the oversized nose is thought to serve some role in modifying and directing the echolocation call. While the nasal cavity is strictly for echolocation, the scent receptors on the top of the head are especially attuned to the smell of Ocimum basilicum. These creatures will chew through walls, human flesh and thinner layers of metal or stone to get to the plant once detected. While they only eat basil, and cannot digest meat, since they can detect the odor of basil even after it has been consumed by another animal, they are considered carnivores, and dangerous ones at that. You do not want one burrowing through your belly to get to your Thai lunch. 7.5 inch vinyl Dudebox Dude, sculpted over with epoxy, painted with polyurethane and and acrylics. Robo Force Returns at ToyFinity on December 20th! News from Toyfinity just keeps better as they continue to pick up vintage toy licenses and do some amazing new things with them. 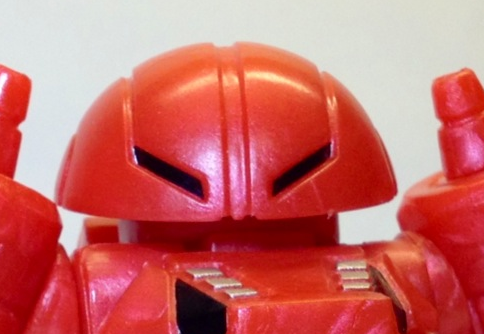 Recently they've been posting previews of their next release of the Glyos-compatible Robo Force figures and now they've told us everything we need to know about the drop happening tomorrow! The next release of ROBO FORCE product will be this Friday, December 20th, at 9:30 pm Eastern Standard Time. It has been a blast coming up with new colors for the Robo Force. The colorways in this release match the recent Onell Gendrone Rebellion/Ecroyex Initiative colors exactly, so you can upgrade your Robo Force with Glyos pieces (or vice versa)! Kit includes the standard 41 piece complement of Glyos compatible parts -now with over fifty paint applications and one secret faction symbol! -allowing you to build either Maxx Zero, Sentinel the Protector, Enemy the Dictator, Hun-Dred or your own robotic creation. $18 per kit, limit of four per customer. 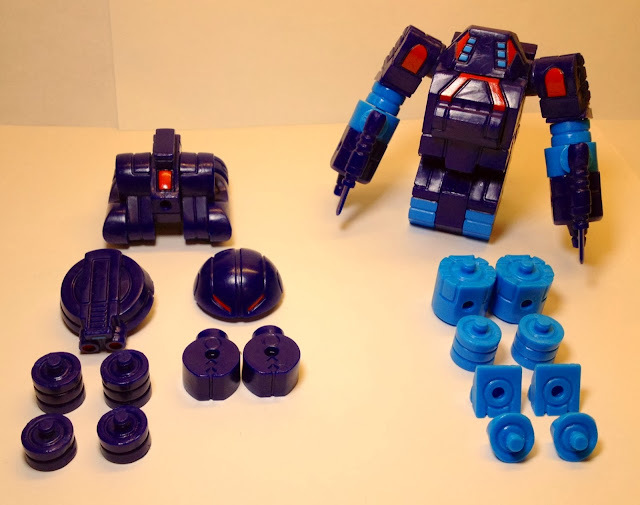 Kit includes the standard 41 piece complement of Glyos compatible parts and an additional 12 pieces for maxximum customization possibilities! With over 50 paint applications and one secret faction symbol, kit can be used to build any of the four main Robo Force characters. $20 per kit, limit of four per customer. Additionally, there will be a limited quantity of Robo Force shirts in the store - only $15 each. Toyfinity is also proud to offer, for the first time, an assortment of Zibits! Zibits are fantastic mini R/C robots with lights and zounds! 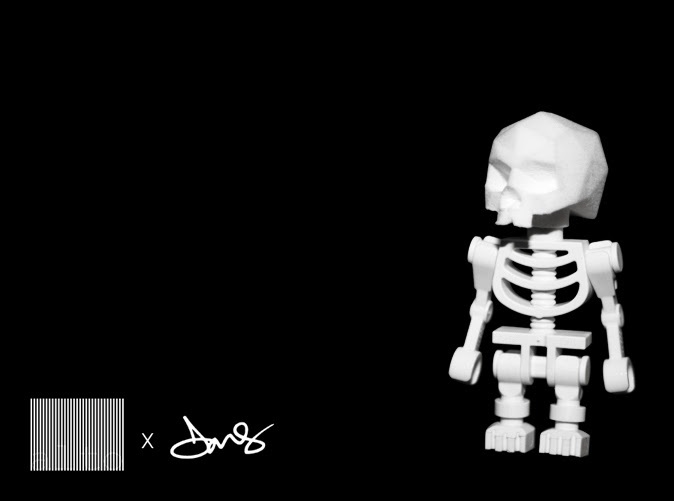 Six different characters will be available in limited quantities. All items will ship directly after the Christmas holiday. After you purchase your new Force members this Friday, be sure to check out the Comics section for a new Robo Force page! Radioactive Uppercut presents Bite-Size, the Undead Wolfman! Hot off the radioactive heels of the successful 8-Ball sofubi figure Kickstarter campaign, the Radioactive Uppercut is ready to unleash the 2nd figure in the Radioactive Rumblers monster toy line; the undead wolfman known as Bite-Size! Bite-Size has been teased online in close-up detail shots for the last month. 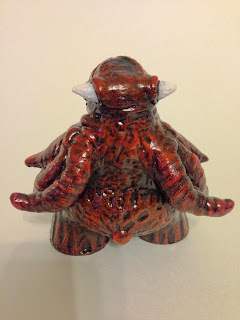 The full moon is now here and the full figure sculpt is revealed! Bite-Size stands at 4” tall, features 3 points of articulation and was superbly sculpted by the ‘titan of the Collectible Toy Industry’, Jean St. Jean Studios! The figure is in scale with 8-Ball and features the same size articulation joints. Reveals for the first two colourway releases will be coming early next month, followed by a pre-order planned for late January/early February on the Radioactive Uppercut Storenvy. Stay tuned to the Radioactive Uppercut Instagram and Facebook pages for full release details and pricing. Don’t get bit, the Bite-Size is on the loose! Extending the Skelevex family, alto and DMS proudly present the Micro Skelvex. This 3D printed piece is available exclusively through Shapeways 3D printing services. As shown in the photos, the Micro Skelevex is compatible with LEGO minigure bodies. The combinations are endless! 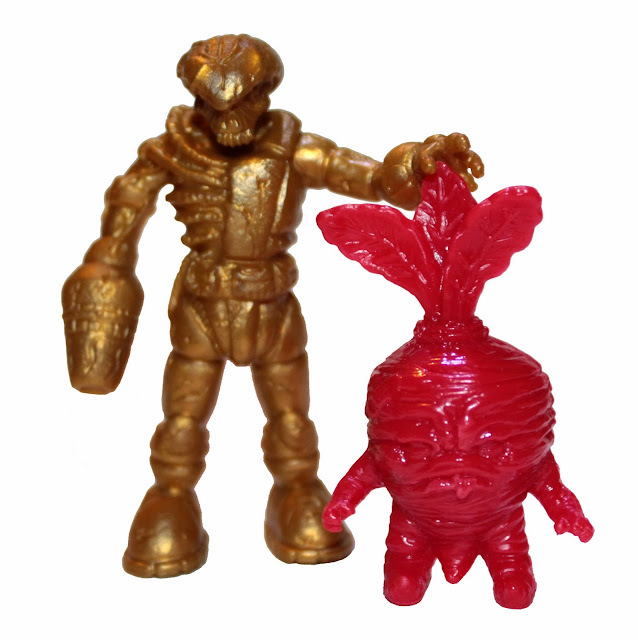 Au Zombie Pheyden & Holly Berry Baby Deadbeet Drop Today From October Toys! 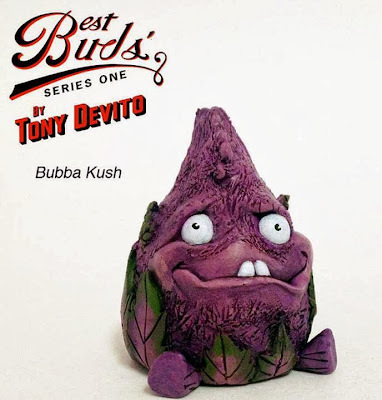 Baby Deadbeet clocks in at 1.5″ of PVC goodness and was designed by Scott Tolleson/sculpted by George Gaspar. 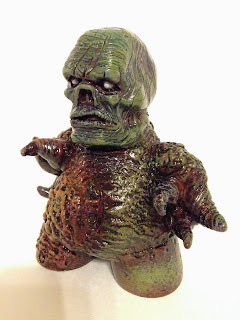 Zombie Pheyden towers over him at just over 2″ tall and was designed by Matt Doughty/L’amour Supreme/sculpted by George Gaspar. Both figures ship loose (no packaging) and can be yours for only $2 each! Limit 5 of each color per order/customer. 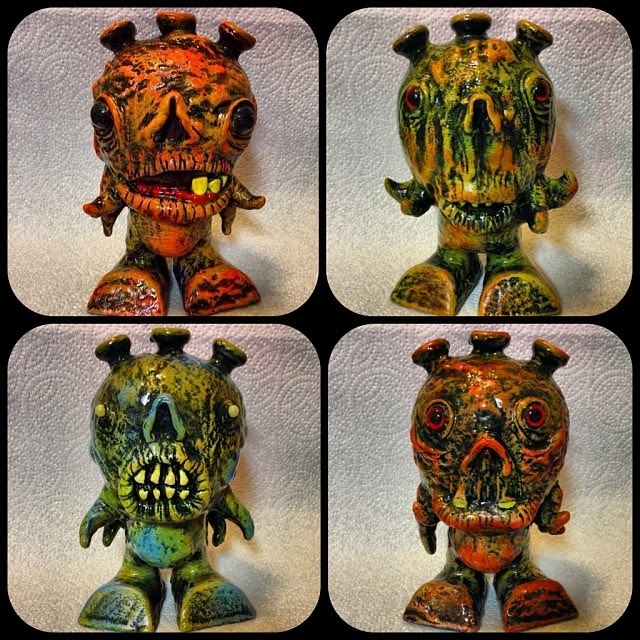 Au Zombie Pheyden & Holly Berry Baby Deadbeet will be available at 12 pm (noon) PST on Sunday December 15th here at October Toys. Mark your calendars! 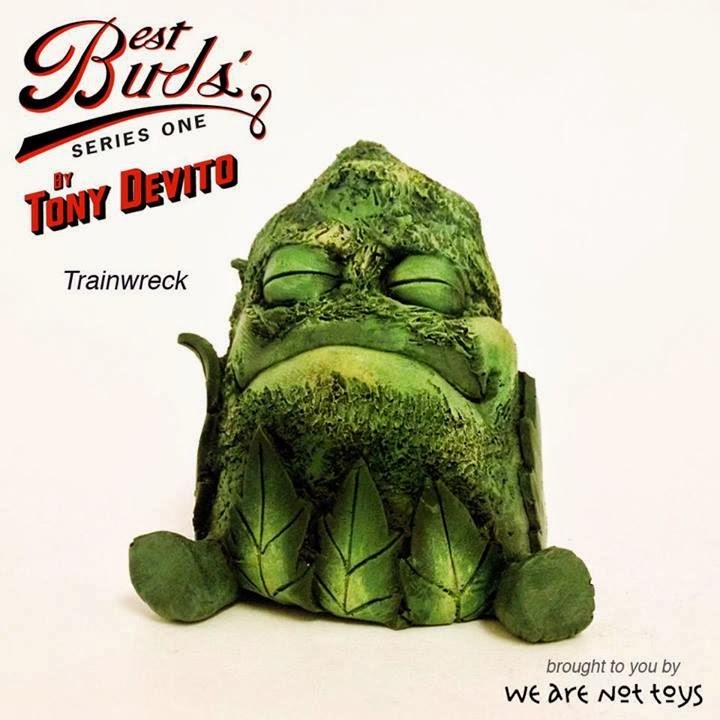 Tony DeVito's Best Buds Series 1 Drops Today! - Final Reveals! Whether you are 420 friendly, know somebody who is, or don't care for the "grass" at all, it is hard to deny the appeal of "Best Buds"; The new 3" collectible series from the WeAreNotToys collective and the slightly intoxicated mind of Maryland based artist Tony DeVito. 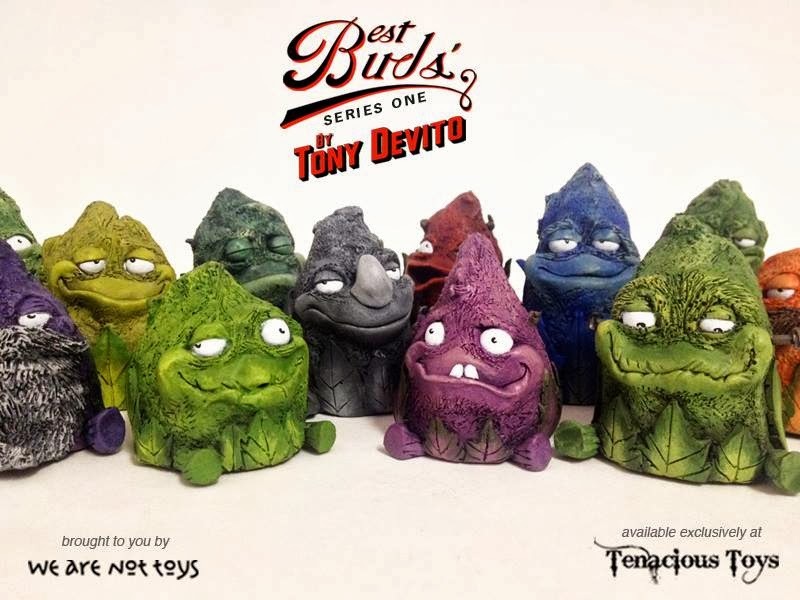 Best Buds, Series One consists of 15 original roto-casted hand painted resin figures, all properly named after some of the most all time popular cannabis strains. Each individual strain will also have three rare golden, silver and bronze nugget color versions, creating various mystery chase figures. *Golden Nugget buds will come with a golden ticket redeemable for Best Bud related goodies and swag from Tony DeVito and WeAreNotToys. Your favorite strain can be your good pal for just $29.99 a piece blind boxed, meaning what you get is up to chance. Or you can better your odds and pick up a whole set for $420.00. A full set includes all 15 strains and a free mystery Nugget color version bud. 16 in all.